Based on Mike Sibley's drawing bible "Drawing from Line to Life", this Intermediate Course will raise you from Beginner towards Advanced. 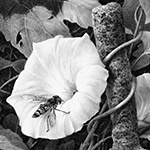 The course uses the same natural progression of drawing techniques that Mike teaches in his UK and USA physical workshops, which has benefited artists who work in many mediums – including watercolour, pen & ink, pastels and sculpture. As your skills progress, you begin to think about the message within your art – be it a simple story, a trigger for an emotional response, or just to emphasise the beauty of something. This course moves into that area – the mental preparation and mindset required to lift your art above the mundane, while covering the creation of textures, exploring negative drawing, and more. You will be taken step-by-step through a series of more advanced techniques - each technique leading naturally to the next. Using a series of drawing exercises, you'll learn not only the 'How' but also the more important 'Why', which Mike will explain in depth. Wherever possible, the guideline drawings have been prepared for you, which will speed up the drawing and learning process. You will need to devote a minimum of four to six hours per week, and more in the final week. Register as an auditing student.